FREE BONUS: Download our Event Fundraising Marketing Guide. You can save this resource as a PDF and use it to help build a strong marketing campaign for your organization’s next event fundraiser! Are you considering new and creative ideas to incorporate into your next fundraising gala? Well, I suggest you consider good ole’ made-at-your-local-vineyard wine. Or, just wine in general! More and more organizations are incorporating fixed priced packages into their mobile bidding events and raising additional proceeds by having a wine pull (or wine wall) available for guests to purchase, along with their traditional silent auction items. What is a wine pull, anyway? Where can you find wine for your wall? 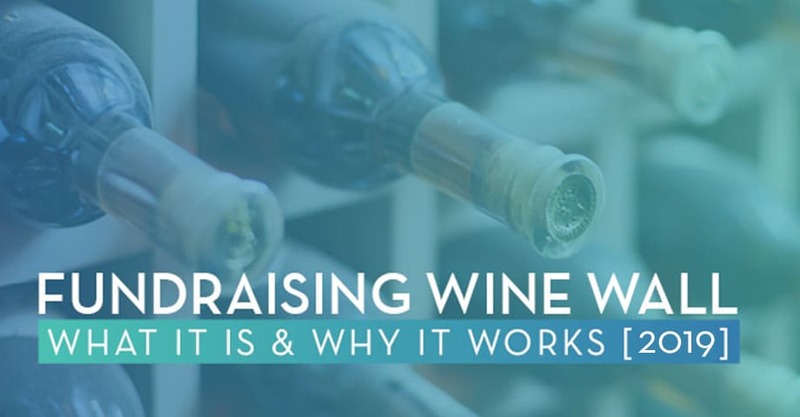 Let’s dive in to read more about how you can incorporate wine into your next fundraising event! What is a Wine Wall, Anyway? Wine pulls are an additional fundraising strategy that you can incorporate into your charity auction or another fundraising event. Basically, you’ll sell supporters the opportunity to choose a random bottle of wine from a wall or table. The average wine pull is priced at around $25. Each bottle will be covered in paper, bags, or another decoration so that supporters will have no idea which wine they’re pulling. The bottles should range in price, so depending on their luck, your attendees might walk home with a bottle that costs less than they donated or is priced significantly higher than what they paid! It’s a game of chance with a tempting prize that not many of your guests will be able to refuse! How Does a Wine Wall Work? It’s Easy! Procure bottles of wine to feature in the pull (a good ratio is about 3 bottles to every 5 guests). Create a fixed price package in your OneCause Planner and call it “Wine Wall”, “Wine Pull”, or something of the sort. Showcase the wine by wrapping the bottles in your event decor colors, fancy bags or however you see fit. You might also want to decorate your display to your theme to give your wine wall a festive edge and help it stand out! Guests can make a purchase under the OneCause Fixed Price Packages online beforehand or on their own smartphone or device at the event. Guests make a random selection from your display of wine to take home or to be delivered to their table during dinner. 1. Ask local vineyards. See if some vineyards in your area would be willing to donate bottles of their wine to stock your wall. Offering sponsorships in return for donations can incentivize more vineyards to give, so really emphasize the additional advertising they could receive! 2. Host a Stock the Wine Wall sign-up party fundraiser. Sign-up parties are fun gatherings that bring a group of people together for a unique activity. Why not host one to stock your wine wall and help bring your community together at the same time? Set price guidelines and have each guest bring a bottle of wine to stock your wall. Of course, in the spirit of sign-up parties, you should provide a fun activity for them to enjoy, too! Voilà! Wine Wall Proceeds Increase. Don’t worry about whether you have secured a few or many bottles of wine. This is a fixed priced package that is very likely to sell out! Consider having the purchased bottles delivered to each table for your guests to enjoy with their dinner and throughout the event. All that’s left is to uncork and enjoy! Charity Auction Software. This article by OneCause can help you conduct further research about the charity auction software in order to best choose your own software solutions. 25+ Unique (And Easy!) Fundraising Ideas. If you’re looking for even more unique fundraising ideas, check out this list of favorites from Funds2Orgs! Event Fundraising Software. While you are planning your event, be sure you have everything you need to ensure its success. This guide to event fundraising software will help you discover the tools you need.